Hey there, Queensville here with another post. I’m feeling very excited this week because I get to share with you my new community map. I’ve been saying for a while that I see myself becoming a very connected and walkable community for you and your family to enjoy – so finally I can show you what I’ve been talking about. The map above shows proposed schools (both public and catholic), library and community centre. It also maps out proposed trails – both multi-use and bicycle specific ones that run throughout me. The map also illustrates the location of the first phase of my construction. It's going to begin in Cedarland, which you can see illustrated on my neighbourhood map. 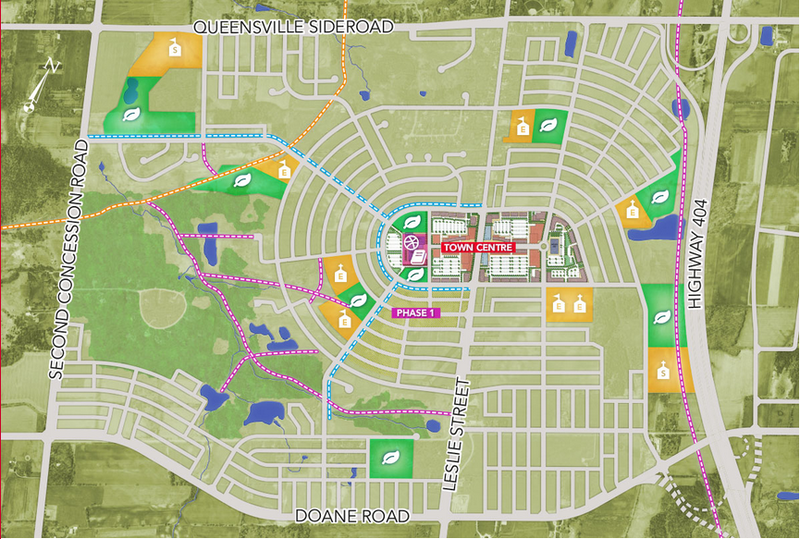 My hope is that this further helps you to see how you will be able to not just live in Queensville, but also live in Queensville. I’m going to be a place for you to work, play and raise your children. Over the coming months you’ll definitely want to be in the loop with what I’m doing, so be sure to register so that I can keep you up to date. I’ll continue to share the things that make me great next week.